Relevant anatomy related to the test is knowledge of the iliotibial band. It starts as the iliotibial tract, which is a thickening of the fascia lata, originating from the iliac crest. The iliotibial tract continues downward, laterally from the femur. At the greater trochanter, fibres of the tensor fascia lata muscle and gluteus maximus muscle inserts in the iliotibial tract. When approaching the knee joint, the iliotibial tract passes the lateral epicondyle of the femur and splits into two structures: the iliopatellar band, and a distal extension inserting at the Gerdy tubercle (Figure 1). During walking and running, the Iliotibial band is subjected to frictional and compressive forces over the lateral epicondyle. Repetitive strain, improper footwear, lower extremity mal-alignments and muscle imbalance cause increased friction. Iliotibial band (ITB) friction syndrome is an overuse injury common in runners, cyclists, weightlifters, skiers, and soccer players. 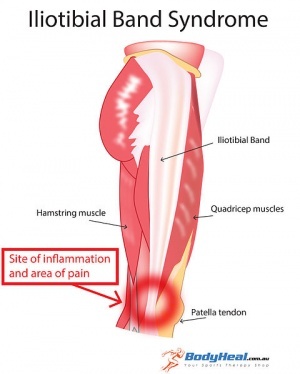 It is characterized by pain over the lateral femoral epicondyle. The purpose of this test is to detect pain, abnormalities, tightness of the iliotibial tract, which can be indicative for the iliotibial band syndrome. It helps to differentiate iliotibial band syndrome from other common causes of lateral knee pain. Procedure: The patient is supine or side-lying with the injured side up. Grasp just above the ankle and slowly bend the knee back and forth several times from 0-90° while palpating and applying firm pressure on the lateral epicondyle of the femur for crepitus with the thumb of the other hand. Interpretation: Palpable snapping, rubbing or “squeaky hinge-like” crepitus or localized pain that increases with pressure at or above the epicondyle (often at 30° of flexion) indicates ITB syndrome. This test is indicative of iliotibial band syndrome, but again it must be stated that there have been no studies to indicate the validity of this test.